If Yes, where did student attend classes? If classes that are listed on our schedule do not appear below, it is because these classes are full and cannot take additional registrations. Also note: just because a class is listed here does NOT mean that the class is not full. Any class can suddenly become full depending on the registrations that come in on a daily basis. Enter following information to calculate amount of tuition and the amount of payment due at registration. 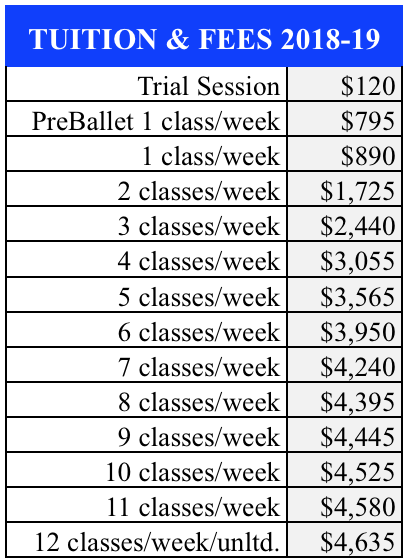 If registering for a Trial Session, please check the box below and enter tuition of $110 for each Trial Class (zero for all other fees, etc). Note: Trial Sessions are only available to students trying a new dance style for the first time at LDA. D. Enter Sibling Discount here (5% of C.) or enter "0"
If student is a younger sibling of a registered student, you are entitled to a 5% discount on the tuition amount of the younger sibling. No sibling discount on Trial Sessions. Choosing Payment in Full saves the $35 Payment Plan Fee. Note: All Payment Plan options require a valid Visa or MasterCard be kept on file at Logrea Dance Academy, for use ONLY if a the payment is not made prior to the 15th of the month in which the payment is due. Payment in Full pays full tuition at registration. Each Payment Plan pays the fraction of payment chosen at registration (ie. the 8 Payment Plan pays 1/8 of the total tuition; and the 2 Payment Plan pays 1/2 of the total tuition at registration) Note: All accounts must be paid in full by Feb. 2019. By accepting the terms and conditions, I certify that I understand that this contract is subject to the terms and conditions stated on the Logrea Dance Academy website and in the current Logrea Dance Academy Student Handbook. I understand and accept all the terms and conditions of this contract, including that once the classes begin for the season (September, 2018), no refunds and no cash credits will be given for any reason. Prior to the start of classes, if a registered student finds that they must withdraw with good reason, a refund of tuition minus the $30 registration fee will be given; and if any of the classes for which the student was registered was FULL, then there will be an additional fee of $40 per full class. This fee is charged because the Academy will have turned away enrollments. (see full Terms and Conditions on our website for full information).